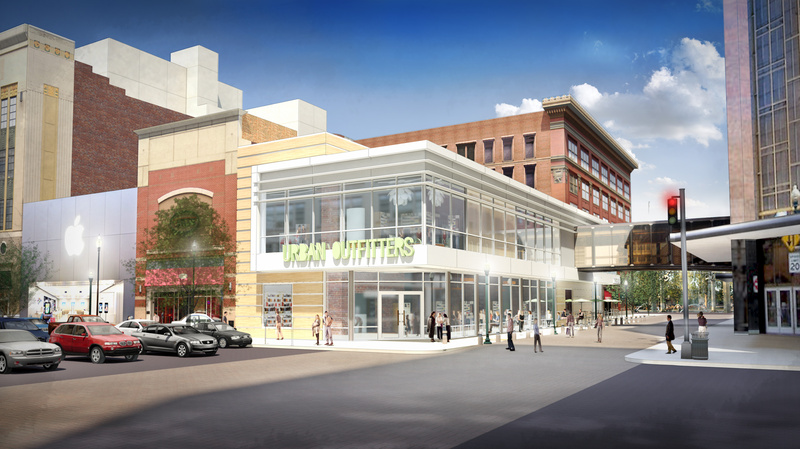 A rendering of the future site of Urban Outfitters is shown from the corner of Main Avenue and Wall Street in downtown Spokane. The public is being asked to help redesign a section of Wall Street from Main Avenue to Spokane Falls Boulevard. A meeting on the street redesign is set for July 21 from 4 to 5:30 p.m. in Room 1A of the downtown Spokane Public Library, 906 W. Main Ave. The city is planning to dig up the street in August to install a new stormwater sewer pipe. In addition, the city has approved the vacation of 17 feet on the west side of Wall to make room for a new Urban Outfitters store. An existing building is being demolished for the project. Twenty years ago, Wall was redesigned with concrete paver bricks, planters, artwork, street lighting and sidewalk tiles. At least one of the planters will have to be removed to allow two lanes of traffic to pass along the narrowed street. Also, a shallow concrete trough installed to capture stormwater has not worked as expected and will be removed. City officials want to hear from the public on their ideas, said Marlene Feist, utilities communications manager. “Maybe it is time for something else,” Feist said. The street lighting could be replaced with fixtures that hold power outlets for future public events. The question of street furniture is also up for discussion. New landscaping is planned. During construction, the street will be closed so that workers can dig a pipe trench as deep as 20 feet at the Main Avenue end of the work. That means rock and dirt will have to be piled next to the trench. Back in the mid-1990s, the city obtained state and federal grants to renovate Wall Street with paver bricks as part of a project by Spokane Transit Authority to run trolley bus shuttles from the STA Plaza to the Spokane Veterans Memorial Arena. Businesses also contributed to the project. The $1.8 million street renovation was completed in 1995. The trolley shuttles subsequently used the redesigned street on their regular route. STA has since phased out the trolley buses in favor of modern buses. Work on the new Urban Outfitters store is scheduled to be completed in June. Work starts today on a long-needed road project in northwest Spokane County. The county is planning to widen and pave Inland Road and Old Trails Road near the area of Nine Mile Falls and Riverside State Park. Flaggers will direct traffic starting today. A complete road closure will begin next Monday. Construction should take two months, with completion expected by Sept. 11. The road will be open Saturday for the Dirty Dash Mud Run. Washington State University Cougar fans from Spokane will be pleased to know that a new passing lane on U.S. Highway 195 from Colfax to Spangle was included in the state transportation package approved by lawmakers two weeks ago. Another passing lane will be built on state Highway 26, according to the CougCenter website. Filming for the popular “Z Nation” television show will close Cedar Street from First to Riverside avenues Tuesday from 8 to 11 a.m.
After that, Wilson Street from Maple to Main avenues and Cedar from Main to Wilson will be closed from noon to 5 p.m. Elsewhere in the city, a southbound lane of Ben Garnett Drive will be closed Tuesday through Friday from 7 a.m. to 1:30 p.m. to clean up the area below Cliff Drive. Also, Barnes Road from Farmdale Street to Indian Trail Road will be closed through Thursday. Work on the Division Street gateway improvements at Interstate 90 is on hold pending delivery of material for the project. Glenrose Road from 57th Avenue to Havana Street will be closed to through traffic for road construction. Ray and Thor streets from Third to 29th avenues will see pavement repair and resurfacing in coming weeks. Storm sewer work near Downriver Golf Course is forcing closure of Columbia Circle from Downriver Drive to H Street and H Street from Columbia to Northwest Boulevard. Repaving work is finishing up on Perry Street from Mission to Indiana avenues, but the one-lane closure of Perry remains in effect until the work is completed. On Interstate 90, workers will close one eastbound lane from 9 a.m. to 3 p.m. through Wednesday to repair concrete barriers. Also on I-90, a pavement repair project near Cle Elum will cause evening and nighttime lane reductions. Rock blasting for the I-90 widening east of Snoqualmie Pass will cause hourlong closures at 8 p.m. tonight through Thursday. Elsewhere on state highways, work on Highway 206 from Bruce Road to the entrance to Mount Spokane State Park is causing traffic to be limited to a single lane. Pavement repair is also causing a southbound lane closure of U.S. Highway 195 from I-90 to Excelsior Road. To the south, traffic on U.S. 195 from Plaza to Cornwall Road will be reduced to alternating lines of traffic during pavement work. Paving continues on U.S. 195 from the south end of Pullman to Babbitt Road and from Railroad Avenue in Colfax to Dry Creek Road. Both are causing traffic restrictions and delays. On U.S. Highway 395 from Immel Road to Arden, traffic will be reduced to a single alternating lane for rut patching starting today through Thursday from 4 a.m. to 3 p.m. In Spokane Valley, the northbound lanes of the Sullivan Road bridge have vehicle size limits. Vehicles over 10 feet wide must use bridges on Barker or Pines roads. Work continues on Argonne Road from Knox to Trent avenues with traffic restrictions. Sullivan Road remains down to two lanes from Sprague to Mission avenues through late July.